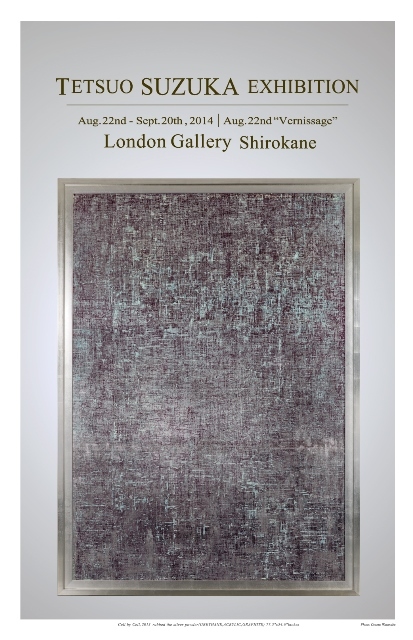 We are pleased to announce the opening of an exhibition of Testuo Suzuka's work at London Gallery's location in Shirokane. This up-and-coming artist was born in Kyoto in 1973, and is now based in Tokyo. His work makes the viewer feel as if they are immersed in the virtual world or digital imagery or video games. He began producing his works with the idea of overcoming data in and of itself, giving it form and making it a sensual reality with presence. The world he has created by interweaving traditional Asian art and cutting-edge production techniques transcends time and space, and the current exhibition leaves you with no sense of time. Here we have collected a number of works that display his personal style, which incorporates the traditional Japanese techniques of ukiyo-e, ink, and gold leaf. We hope you will take advantage of the opportunity to come and see the show. In the age of information that we live in, visual information does not stay fixed from day to day, but expands over geographical distance and all points in space. Even when virtual reality comes in a distorted form or guise, it is in effect still reality. In this exhibition, I hope to inspire the minds of people who encounter my works just as they would encounter reality, with no regard to pixel count or resolution. Formed motion graphics studio "ANNY" with his younger brother, Koji Suzuka. First solo exhibition at bft Gallery, called "Japanology"